A dead calf, thought to be evidence of the Aspen Pack's "third strike." Note: This article is a sidebar to this issue's feature story, "Last chance for the Lobo." 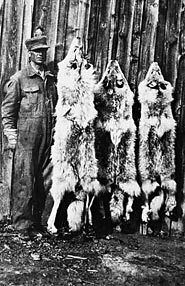 Mexican wolves extirpated from the Southwestern U.S. by private, state and government control campaigns. 1976 Mexican wolf listed as endangered under the Endangered Species Act. 1977-1980 Five wolves captured in Mexico to establish a captive breeding program. 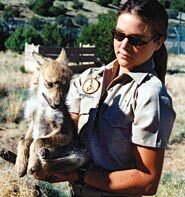 1982 Mexican Wolf Recovery Plan completed, with a goal of maintaining a captive breeding program and re-establishing 100 wolves within their historic range. 1990 Wolf Action Group files suit against U.S. Fish and Wildlife Service alleging failure to implement the Mexican Wolf Recovery Plan. 1998 U.S. Fish and Wildlife Service releases the first Mexican wolves into the wild in the Blue Range Wolf Recovery Area. 1998 New Mexico Cattle Growers Association, et al, file suit against U.S. Fish and Wildlife Service, alleging violations of National Environmental Policy Act, Endangered Species Act, and Administrative Procedures Act in authorizing and implementing the Mexican wolf reintroduction project. First Mexican wolves translocated into the Gila Wilderness in New Mexico. 2001 Pursuant to the Final Rule, U.S. Fish and Wildlife Service completes the 3-Year Review. Scientists recommend program should continue but with modifications. Congress directs U.S. Fish and Wildlife Service to conduct an independent review of the 3-Year Review. The independent review determines the need to restore the states' role in the Mexican wolf recovery program; U.S. Fish and Wildlife Service begins to restructure the Mexican wolf program with the help of states and tribes. Coalition of Arizona and New Mexico Counties, et al, file a 60-day Notice of Intent for violations of NEPA, ESA and APA, alleging Mexican wolves are hybridizing with domestic dogs. U.S. Fish and Wildlife Service discovers a hybrid litter of Mexican wolves; pups euthanized. San Carlos Apache Tribe passes resolution to remove all Mexican wolves from the Reservation. Coalition of Arizona and New Mexico Counties, et al, files suit regarding the 2002 Notice of Intent, alleging the U.S. Fish and Wildlife Service: 1) failed to consider the impacts of hybridization; 2) failed to prepare a supplemental EIS; and 3) violated FOIA by improperly withholding documents. San Carlos Apache Tribe enters into a cooperative agreement with U.S. 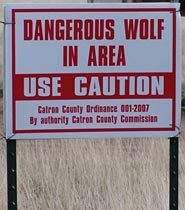 Fish and Wildlife Service for wolf monitoring and management, including removal. Defenders of Wildlife, et al, files suit against U.S. Fish and Wildlife Service regarding the Gray Wolf Reclassification Rule. Twelve wolves are killed in the Mexican wolf recovery area, seven by illegal shooting. The first release of a pack of Mexican wolves occurs on White Mountain Apache tribal land. New Mexico Game Commission asks state Game and Fish Department to re-evaluate management of wolves, and to allow direct releases into New Mexico. Courts rule in favor of U.S. Fish and Wildlife Service regarding the Arizona and New Mexico Coalition of Counties, et al, hybrid lawsuit; lawsuit dismissed. Arizona and New Mexico Coalition of Counties, et al, file for appeal regarding the hybrid lawsuit. The AMOC completes the Mexican Wolf Blue Range Reintroduction Project 5-Year Review. Included are a set of 37 recommendations for improving management of the project, many of which would require a change to the Final Rule. USFWS sets out to capture members of the Hon Dah pack, which had chowed down on seven cattle. Ten of the wolves die in captivity. USFWS shoots two members of the Nantac pack because they killed four cows. USFWS initiates a "Wolf Harassment Program" that allows certain people in wolf country to shoot wolves with paintballs in order to "reinforce their natural fear of humans." 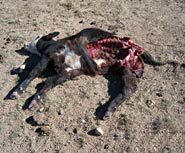 USFWS shoots alpha female of Durango pack after it gets its third strike - or kills its third cow. A Catron County rancher admits to High Country News that he enticed the wolf into the third strike by branding cattle near a known wolf den. The Aspen Pack, including three pups, is removed from the wild because its members have been killing livestock. The pups may ultimately be re-released in the recovery area. The remainder of the Durango pack vanishes. As of press time, the USFWS had failed to detect any radio signals from its collars.